The Government has, since around 2013, been providing additional funding to improve provision of physical education (PE) and sport in primary schools. This funding - provided jointly by the Departments for Education, Health and Culture, Media and Sport - is ring-fenced and therefore can only be spent on provision of PE and sport in schools. But there is freedom to choose how we do it. It will see money going directly to primary school headteachers to spend on improving the quality of sport and PE. Each school receives this year £16,000 plus an extra £10 per pupil each year. This equates to approximately £16,500 this year for our school. All schools have to spend the sports funding on improving their provision of PE, sport and healthy living. The impact of the initiative will be monitored by the Headteacher, PE Subject Leader and Governing Body. At our school, we already invest a great deal of time and energy into making sure that all children have opportunities to be involved in competitive sports and other physically challenging activities. We have enthusiastic netball and football teams, coached by staff and volunteers and we look for chances to play against other schools in both league and friendly matches. To make sure this tradition continues, our older children run clubs for younger children at lunchtime. However, we also place great emphasis on those activities which we hope will become lifelong habits. For example: surfing, swimming, cycling, walking and running through lunchtime and afterschool clubs, taster days, school trips and sponsored events. We are also determined that our staff have the necessary knowledge and skills to encourage and support all of our children to achieve their potential. As a result of our work over the last year, we have once again been awarded the Sainsbury's School Games Gold Award. Sainsbury's School Games is an initiative supported by Sport England, The Department for Culture, Media and Sport and the Youth Sports Trust. 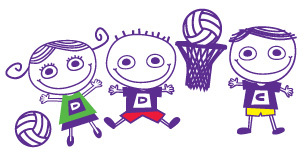 It aims to give every child the opportunity to participate in competitive sport. Part of this initiative (School Games Mark) rewards schools for their commitment to, and the development of, competition within their school, and allows them to work towards three different awards: bronze, silver and gold. We were delighted to find that we have now met the standards for the third level award (Gold), guided by Mrs Symons, our PE Subject Leader. Click here for information about how we plan to use our Funding this year. Click here for an evaluation of the impact of last year's school PE and Sport funding. Click here for a calendar of competitive events we took part in over the last school year. 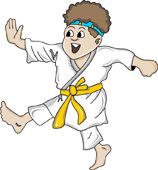 Devon Wado-Ryu Karate-Do Kai was established in 1984 by by the late Sensei T. Takamizawa 7th Dan Kyoshi Shihan and his student Sensei Peter Hill 6th Dan who visited us recently to lead two workshops for our Key Stage 2 children in 'the most honourable and correct way'. Although he said our children were 'a pleasure to teach and spend time with', we enjoyed his visit equally as much. For more details about the club, please visit: www.devonwadoryu.co.uk/1.html .